Overview - Sekiuchi, boss of the Sannokai, a huge organized crime syndicate controlling the entire Kanto region, issues a warning to his lieutenant Kato and right-hand man Ikemoto. Kato, in turn, orders Ikemoto to bring a rival gang in line, and immediately passes the task on to his subordinate Otomo, who runs with his own crew. The tricky jobs that no one wants to do always seem to end up in Otomo's lap. In a genre as crowded as the gangster film, it's always nice to see directors try new things. 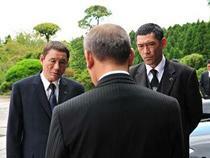 With 'Outrage: Way of the Yakuza,' Japanese filmmaker Takeshi Kitano does just that. While his experimentation in narrative convention is commendable, the results are decidedly mixed, eschewing traditional drama for a more sprawling style that meanders just as much as it excites. Filled with powerful bursts of action that punctuate more contemplative stretches focused on gangster politics, the movie unfortunately lacks a compelling lead, failing to completely engage on an emotional level. There is a lot to admire about the style, but the loose scripting doesn't end up leaving much of an impression. Set in the seedy underworld of Japan, the movie follows several feuding Yakuza families as they try to one up each other in order to rise through the ranks of their organization. As each clan attacks the other, the mini skirmishes begin to escalate, leading to an all out war between the participants. Various alliances are formed and broken, and it eventually seems like no one can be trusted. With the balance of power shifting by the minute, only one question remains. Who will be left standing when the dust settles? Lacking a true overarching plot, the movie is mostly structured as a series of gangster attacks and retaliations. One family will make a move against another, who will then strike back, talk to the head honcho, smooth things over, rinse, repeat, and so on. While this process leads to some interesting scenarios, the endless back and forth can get rather tedious. A subplot involving an illegal gambling facility takes up a fair chunk of time during the second half, but it's not long before the movie settles back into its earlier routine. This all basically results in about two hours of various sit down meetings between Yakuzas as they yell at each other and complain. Of course, there is a fair helping of violence lumped in between all the threatening as well, which livens things up quite a bit. In fact, the movie is home to some absolutely brutal scenes with very graphic fits of aggression. A dark, twisted sense of humor also permeates the work, adding a tinge of dry absurdity to an otherwise realistic tone. Kitano brings an interesting, almost minimalist aesthetic to the proceedings. Lingering shots create a moody atmosphere while quick cuts come during moments of extreme violence and action, ramping up the tension. The score follows suit, with a low key style that uses ambient effects and sounds in conjunction with sparse musical cues. This unconventional approach ends up complementing the script's equally irregular beats. Unfortunately, though the film is home to a large ensemble cast of distinct characters, there is very little individual development. By spreading the action across so many different gangsters in various levels of the organization, the movie forgoes a true central protagonist. An argument could be made that Otomo (played by the director himself, Takeshi Kitano) eventually takes center stage, but his character's emphasis comes too late in the game to actually drive the plot. Really, one could say that the Yakuza itself is the central lead, which sounds interesting on paper but isn't as compelling in practice. In the included special features the director talks about a desire to avoid traditional personal drama, and that's exactly what he does. With very few exceptions, we don't really see the characters outside their roles in the Yakuza, limiting our exposure to them to instances of crime and murder. Coupled with the lack of a central lead, this break from the standard mold is intriguing but presents too many problems to truly prove successful. Without anyone to fully invest in, the endless series of escalating feuds feel rather listless, and without a true, overarching narrative, the film never seems like it's going anywhere. 'Outrage: Way of the Yakuza' presents an interesting take on the gangster genre. By eschewing the standard emotional plot points found in similar efforts, the director offers a new spin on old conventions. Unfortunately, the sprawling cast is missing a central protagonist to latch onto, and the overall plot feels too disconnected to fully engage. On one level, I applaud the filmmakers for trying something new, but in this case their unusual choices just prove why the standard conventions work so well in the first place. There is some admirable craft on display here, but the whole exercise just ends up feeling pointless. Magnolia brings 'Outrage: Way of the Yakuza' to Blu-ray on a BD-50 disc housed in a keepcase. Some skippable trailers play upon startup before transitioning to a standard menu. The packaging indicates that the release is region A compatible. The movie is presented in a 1080p/AVC MPEG-4 transfer in the 2.35:1 aspect ratio. With a clean, stylized appearance the transfer looks quite good with several impressive moments. The source print is pristine with a very light layer of grain visible periodically. Clarity is very good throughout, with a sharp image that reveals all the fine details of Kitano's artful compositions. The way light reflects off of the various Yakuza's shiny black cars is especially impressive, adding some welcomed pop and dimension to the image. Colors are nicely saturated but do veer toward a slightly subdued palette. Whites are bright and intense without clipping detail. On the downside, black levels are noticeably elevated, with dark scenes appearing slightly grey rather than deep and inky. Though black levels aren't perfect, this minor issue certainly isn't a deal breaker, and the rest of the transfer is both technically and artistically strong. With no signs of unnecessary processing or artifacts, the video presentation should please most viewers. The movie is provided with a Japanese DTS-HD Master Audio 5.1 track along with optional English, English SDH and Spanish subtitles. Sound plays a very key role in the film and the mix features an exceptional blend of subtle design and explosive power. Dialogue is crisp and full throughout. The soundstage is extremely wide and expansive, breathing life into the movie's various environments. Quiet stretches offer appropriate ambiance in the rears with background chatter and drifting cars flowing about the room. Directionality is precise and movement between the speakers is fluid and natural. Even tiny effects carry an impressive level of nuance, with little sounds, like a character's drag from a cigarette, coming through with pronounced fidelity and weight. The film is almost deceptively quiet for the majority of its running time, but when things do get loud the track absolutely explodes with aggression. A few key bursts of auditory violence are particularly memorable, especially a brief car chase and crash that brings some room shaking low end rattle. Various gunshots and punches hit with deep thumps and pops in between the film's more delicate moments, demonstrating great range and diversity. Thankfully, all these quiet and loud effects are balanced well together. With sharp fidelity, and a great mixture of quiet ambiance and aggressive thrills, 'Outrage: Way of the Yakuza' sounds fantastic. This is an artfully designed mix that truly immerses the audience within the content. Magnolia has put together a nice assortment of supplements including lots of behind-the-scenes footage and interviews with the cast. All of the special features are presented in 1080p with Japanese Dolby Digital 2.0 sound and English subtitles, unless noted otherwise. Cast Interview: Making Outrage (HD, 19 min) - Presented with Japanese DTS-HD MA 2.0 audio, this is a series of interviews with the cast and director, along with some behind-the-scenes footage interspersed throughout. The participants discuss what it was like to work with Kitano and elaborate on their roles. Though some of the comments are a bit superfluous, several worthwhile anecdotes are shared about the shoot. Outrage Inside Out: Behind the Scenes Documentary (HD, 37 min) - Here we are treated to lots of raw on set footage of the director in action, giving us an intimate peek into the production. Some brief interviews with the cast and crew are also thrown in every now and then, including an interesting discussion about the film's innovative music and sound design. Cast Panel Interview (HD, 14 min) - In this supplement, four cast members (including the director) sit down for a panel interview. The participants discuss the movie's dry style and lack of personal drama. Though some info is repeated, there are a few new insights offered as well. Premiere Q&A (HD, 24 min) - This is a Q&A with the cast and director conducted after the film's premiere. Each participant introduces themselves and then shares some brief stories about the shoot. While light on useful information, it is amusing to hear the cast joke about how little direction Kitano actually gave them. From the way they describe the filmmaker's very hands off approach, I'm not even sure some of the actors actually got to meet him. Cannes "Red Carpet" Premiere with Takeshi Kitano (HD, 9 min) - Here we get lots of footage of the director at Cannes as he sits down for various interviews and attends the premiere screening. Unfortunately, there isn't a lot to gain from this. U.S. Trailer (HD, 2 min) - The U.S. trailer is included with DTS-HD MA 5.1 sound. TV Spots (HD, 2 min) - Four TV spots are included together with separate chapter breaks and DTS-HD MA 2.0 sound. Also from Magnolia Home Entertainment Blu-ray (HD) - Several more trailers for other Magnolia releases are provided. 'Outrage: Way of the Yakuza' is an interesting but not altogether successful effort from Takeshi Kitano. Though elements of the script and style are unique, the meandering plot lacks emotional drama and a true protagonist, making it hard to completely connect with the material. The video transfer is good and the audio mix is fantastic. There is some repetition in the supplements, but most of the included extras are informative and worthwhile. Despite some flaws, the movie is still worth a look and the disc itself is strong. Fans of the director's other works, or the Yakuza genre in general, will definitely want to give this a rent.